None problem in the 3D view in virtual visitors mode while "walking around", whatever the project. It seems that each PC has own problem. Congratulations on the release of 6.0. Quite remarkable. Still working my way through all the new features in different settings. Only significant problem is that I have to redesign my sky textures and models completely... . So, THANKS! As for processor usage: Except when testing with giant sky textures, I have not noticed any slowdown with 6.0 under Windows. Compared to previous versions, it seems pretty similar to me. I (mostly) run SH3D on a slow computer with no extra headroom, but as long as I stay away from too big models and to much creative use of light, 6.0 seems pretty quick to me. In fact, I am pleasantly surprised that the richness in features work without noticeable slowdown. But yes, in certain circumstances, SH3D will grab every resource available. Just like other software when doing certain tasks. It’s possible that the GPU has more work in this version because of the lighter management of the frustum front and back distances, but this should also lead to more fluid moves in the 3D view. Mike, your own 3D models can’t be deformed without modification. Please read this post for more information. Thx for the response, i did see the topic but the pictures did not fully explain it and unfortunately its all written in greek, as is the topic about showing the sash openings, so i guess i'll just use groups. ... but this should also lead to more fluid moves in the 3D view. I compared this in 5.7 and 6.0 and I have to say yes, in 6.0 there is way less stumbling while walking around with the virtual visitor! 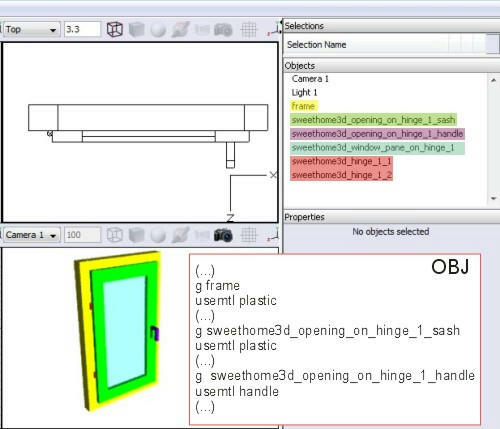 "Sweethome3d_window_pane_on_hinge_1" is special prefix - combination of "sweethome3d_window_pane" and "sweethome3d_opening_on_hinge_1"
Why hinges with the same color are not in one group? Because they are not connected and probably would be exported as separate groups anyway - it depends on modeling software you use. They could make one group as well. 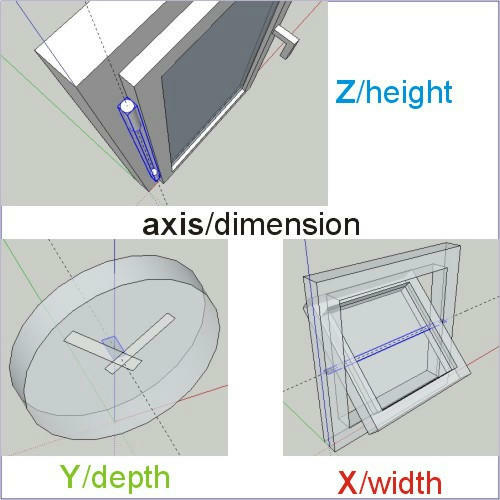 Hinges (visible or hidden) should be centered on axis of rotation parallel to height, width or depth of your model (assuming it's oriented properly to axes X,Y and Z). The largest dimension of all selcted/grouped objects making one hinge should be oriented along that axis/dimension. Your personal objects will be "deformed" after You've add the specific prefixes like Emmanuel and alaX explained. I've do this also with my doors and I try to do for most of the furniture from Contribution furniture. For more help I'am available for You on mail. Thank you Dorin i may take you up on the offer. I still don't know if "modify deformation" gets added during the process of making the object or if it needs to be a library item 1st .... is the "modification" made in the mtl or object file ... is it made with the library editor or similar.. lots of don't knows. Thanks for the offer, it is much appreciated. You must modify the obj file. (with Notepad++/ ArtOfIllusion/ Blender). Rename the moving part with new prefixes. I will tray to do this directly from SH3D when I'll have some time to test. At that moment I don't know other way.